“I love going to my Growing Dome every day as a place to enjoy the peace it brings. We live in a mountain home with a very short growing season. 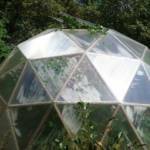 The Growing Dome has made gardening a reality for us (as well as protecting it from the deer). As an experiment I made some self watering planters out of storage totes this year. Due to work, etc. I did not get them finished or anything planted in my Growing Dome until June, but thanks to the environment of the Growing Dome everything has exceeded my expectations. The planters are here to stay. In one planter (storage tote) I planted eight cucumber seeds. 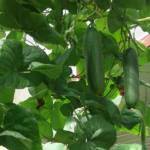 I have picked over 100 cucumbers so far this season and there are still more coming! The pole beans have grown so big they are creeping out the top of the Growing Dome. We have had more tomatoes than we can eat, as well as zucchini squash.